One hundred and twelve students received their nursing diplomas at the Trinitas School of Nursing’s 161st Convocation Ceremony held at St. Michael’s Church in Cranford, New Jersey including Stephanie Ribeiro De Souza of New Providence. Surrounded by family, friends, and staff that supported their efforts every step of the way, 99 women and 13 men proudly accepted their pins and diplomas. They also became eligible to sit for the NCLEX-RN registered nurse licensing examination. Graduate nurses took part in the occasion in various ways. The ceremony began with “America the Beautiful,” sung by Huguette Jean, accompanied by her husband Arrold Jean on the piano. The Welcome speech was given by Anaelisa Ramirez, while the Senior Class Address was delivered by Rebecca O. Thompson and the Closing remarks were given by Pamela Santamarina. Trinitas School of Nursing, a collaborative nursing program of Trinitas Regional Medical Center and Union County College, currently holds full accreditation from the Accreditation Commission for Education in Nursing (ACEN) and the New Jersey State Board of Nursing. The National League for Nursing has awarded the School of Nursing a third designation as a Center of Excellence in Nursing Education status for the years 2015 – 2020 for Creating Environments that Enhance Student Learning and Professional Development. The majority of the full-time faculty and administration are doctorally prepared and hold certifications as NLN Certified Nurse Educators (CNE). The School holds a 25-year, 50-class national RN licensing examination (NCLEX) average pass rate of 95% on first attempt. 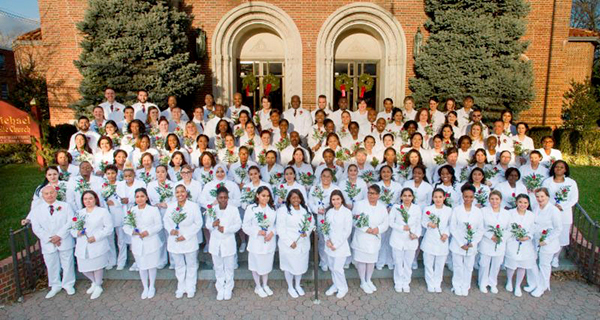 (above) Trinitas School of Nursing Class of January 2019 photographed outside St. Michael’s in Cranford.